French writer; born at Schirhoffen, Alsace, May 10, 1811; died at Paris Oct. 18, 1898; grandson of R. Abraham Kellermeister. He was destined by his parents for a rabbinical career, and was sent to Frankfort to pursue his preparatory Talmudic studies. At the same time he studied German, French, English, Italian, Latin, and Greek literature. In 1837 he abandoned his rabbinical studies, and left Frankfort for Paris with a letter of introduction fromHeinrich Heine which procured him speedy admission into the salons and journalistic circles of the French capital. He became a contributor to the "Revue du Progrès" (edited by Louis Blanc), the "Démocratie Pacifique," the "Presse," the "Gazette de France," "L'Opinion Nationale," the "Figaro," and the "Temps," to various journals of Frankfort, Stuttgart, and Hamburg, and to the "Archives Israélites," the "Univers Israélite," etc. The publication of his "Histoires de Village" (1847), to which Heine wrote a preface, and of his "L'Ami Fritz" and "La Petite Fadette" marked his entrance into the field of romance. He was perhaps the first French writer to conceive the idea of depicting village scenes and writing rustic idyls. Among his numerous admirers may be mentioned Giacomo Meyerbeer and Victor Hugo. 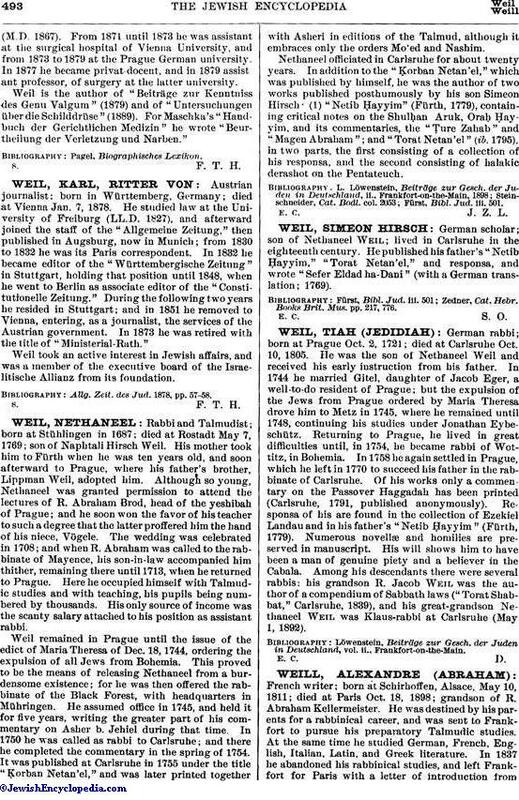 Weill was a born polemic, and he wrote a number of brochures on some of the leading questions of the day; among these may be mentioned: "République et Monarchie," 1848; "Le Génie de la Monarchie," 1849; "Que Deviendront Nos Filles?" 1863; "Mes Batailles," 1867; and "Lettre de Vengeance d'un Alsacien," 1871. In the "Corsaire" of March 2, 1848, he addressed a remarkable letter to Hippolyte Carnot, the minister of public instruction and father of the late president of the French republic, Sadi Carnot. In this letter, which bore the heading "Une Révolution à Faire," he strongly urged a more general instruction in foreign languages in the public schools. 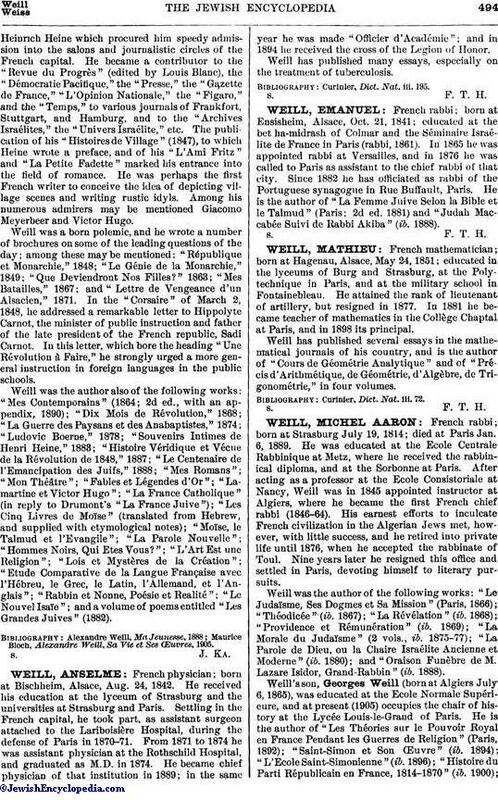 Weill was the author also of the following works: "Mes Contemporains" (1864; 2d ed., with an appendix, 1890); "Dix Mois de Révolution," 1868; "La Guerre des Paysans et des Anabaptistes," 1874; "Ludovic Boerne," 1878; "Souvenirs Intimes de Henri Heine," 1883; "Histoire Véridique et Vécue de la Révolution de 1848," 1887; "Le Centenaire de l'Emancipation des Juifs," 1888; "Mes Romans"; "Mon Théâtre"; "Fables et Légendes d'Or"; "Lamartine et Victor Hugo"; "La France Catholique" (in reply to Drumont's La France Juive"); "Les Cinq Livres de Moïse" (translated from Hebrew, and supplied with etymological notes); "Moïse, le Talmud et l'Evangile"; "La Parole Nouvelle"; "Hommes Noirs, Qui Etes Vous? "; "L'Art Est une Religion"; "Lois et Mystères de la Création"; "Etude Comparative de la Langue Française avec l'Hébreu, le Grec, le Latin, l'Allemand, et l'Anglais"; "Rabbin et Nonne, Poésie et Realité"; "Le Nouvel Isaïe"; and a volume of poems entitled "Les Grandes Juives" (1882). Maurice Bloch, Alexandre Weill, Sa Vie et Ses Œuvres, 1905.